Uses: When a high risk situation requires the highest standard in protection. 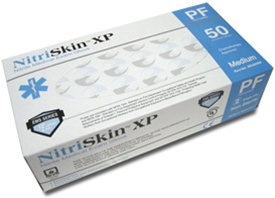 These nitrile synthetic gloves are 33% longer and 50% thicker than ordinary nitrile exam gloves. Excellent donning properties and a textured, slightly tacky surface for a better grip in wet or dry conditions. Light blue color. NitriSkin™ Chemotherapy Gloves offer a high valued and dependable solution to those allergic to natural latex protein. Meets and exceeds the standard emergency glove medical of NFPA 1999 Standards on protective clothing for Emergency medical operations, 2003 Edition. Tested approved by SEI for water leak test that meets all the requirements of ASTM 6319-00 and NFPA 1999, Edition 2003. Tested for use with Chemotherapy drugs. Special Features: Much softer and elastic than other nitrile gloves without any latex additives. 100% latex free eliminates potential allergic reactions to natural latex protein. Textured surface provides strong grip for both wet and dry applications. Superior puncture, tear and chemical resistance with excellent tactile-sensitivity and dexterity. Textured, slightly tacky surface for a better grip in wet or dry conditions. Quantity: 50/box, 10 boxes/case (1 case = 500 gloves). Gloves are ambidextrous (each glove fits either hand). Quality: Meets or exceeds ASTM D6319. This glove meets the emergency medical glove requirements of NFPA 1999, standard on protective clothing for emergency medical operations, 2003 edition. Other: This glove is for single use only. detected up to 240 mins. Applies to all Nitrile sterile and non-sterile Exam and Surgical gloves. Gloves used for protection against chemical exposure must be selected specifically for the type of chemicals used. Review material safety data sheets for the chemicals being used to determine the required level of protection. Additionally tested per ASTM F739 for use with chemo drugs, which can be especially damaging to a glove or cause a glove failure.